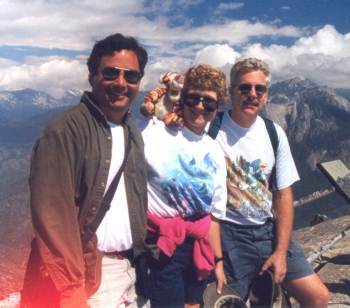 This trip was originally planned to be a trip to Yosemite with our good friends Walt and Barb, but when we tried to make reservations back in March there was nothing available for that weekend - not even a tent cabin in Curry Village! A few days later I received a flyer in the mail advertising the new Wuksachi Lodge that was opening in Sequoia National Park in late May, along with a coupon good for 25% off the room for the first two weeks in June - which just happened to be the time we had planned to go somewhere. :-) I had no problem making a reservation, and we were set to go. 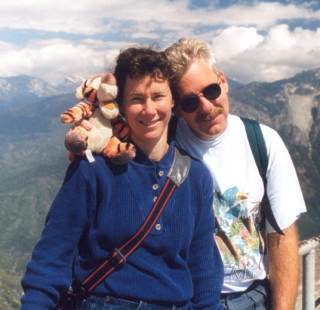 Lee and I finished packing our car that morning, said goodbye to the cats, and I drove him to work. We left work about 2:00 and stopped to pick up Walt and Barb. Fitting all 4 of us in our Saturn was a bit cozy, but we'd all packed pretty lightly, so we actually had extra room in the trunk. We were on the road a little before 3:00, and we were amazed that we sailed around L.A. (we took the route that skirts the foothills, which actually *doesn't* add that much driving distance, and has a LOT less traffic), with very few slowdowns. We hit a very heavy rainshower going over the Grapevine (windshield wipers on high still couldn't quite keep up for a while), but we still made it to Bakersfield by about 7:00. We stopped at Marie Callender's for dinner. It was a nice dinner, though Lee had to send his steak back because it wasn't cooked enough - that sort of thing usually happens to me. :-) And they were out of chocolate satin pie...waaaaaaah! Gram made us pancakes and sausage for breakfast, and our sister-in-law, Dee Dee, came over with our nephew Chaney for a visit. He'll be a year old in a month, and we hadn't seen him since Christmas - he's changed *just* a bit. :-) Not quite walking yet, but pretty close. 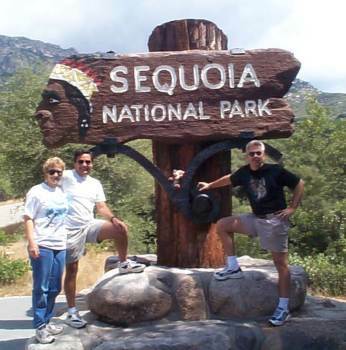 We said our goodbyes and headed off to Sequoia - the southern entrance is only about an hour away from Visalia. 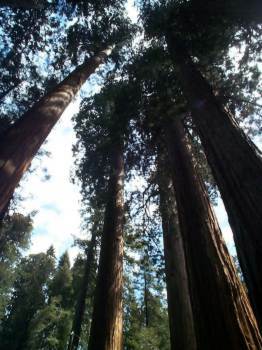 It was a beautiful day in the Central Valley, but the forecast in the Sequoia region was only for a high of around 54 - and that turned out to be quite an exaggeration. :-) Lee and Walt decided to wear shorts anyways. It was still sunny when we arrived at the Visitor's Center at the Ash Mountain entrance to Sequoia National Park, but the clouds were starting to form, and the rangers were warning everyone that it had snowed up in the Giant Forest area the day before, and to watch for icy spots on the road. Hmmm. We made our way up the road, stopping several times along the way so that I could photograph wildflowers. The last time we were along this road was two years ago in April, and there were different flowers then, since it was earlier in the season. This time there were a lot of Mariposa lilies in bloom, which were lovely. There wasn't much traffic on the road at all. The road climbs very steeply - probably gains about 4000 feet in only 20 miles. As we got higher, we drove into a cloud, and everything got very foggy and misty. There was some snow on the trail, and we had it almost all to ourselves - we only saw one other couple. It was very quiet, and the fog made everything sort of ethereal and eerie - it was a neat experience, though not something we'd want to do all the time! 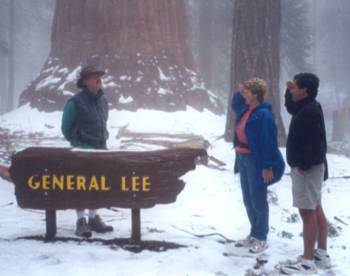 After we finished we walked over to admire the General Sherman tree, which is labelled the "World's Largest Living Thing" (by volume - 52,500 cubic feet as of 1985 - and it's grown since then). There were more people there - most of them just come to see the Sherman tree and then leave, I guess. Since it was 3:00 by then and the weather wasn't conducive to any further outdoor activities that day, we decided to just take it easy and nap and read for the rest of the afternoon. We each had a room with a king size bed (yay!) 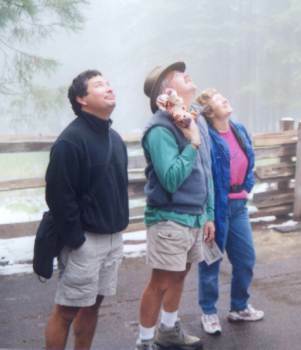 - ours looked onto the woods behind us, and Walt and Barb's looked out towards the mountains - or so they were told - at that point it was just a gray fog. :-) At least we *did* manage to find the hotel buildings in the mist. But still, all-in-all it was a very nice place - even if the bathroom walls WERE painted avocado green...ick. We picked up Walt and Barb and drove to dinner - it turns out the main building is not far away, but we just couldn't tell in the fog! They don't have the lighting installed on the paths yet (and many of the paths are still under construction). We got a great table in the restaurant right near the fireplace - though unfortunately there was no fire. (Yet another suggestion. :-) ) We got a brief glimpse out the window of the mountains before the fog swallowed them up again - our waitress informed us that this type of weather was typical for June. Uh oh. Anyone want to head back to Visalia??? The restaurant supposedly features "Asian-Pacific" cuisine, but it was more noveau Californian in my opinion. One of the specials that night was Veal Liver - there were no takers at our table. :-) Dinner was really good - especially the blackberry pie that we all had for dessert. We rolled out of there about 8:30, and headed back to our rooms - deciding to meet for breakfast about 7:30. 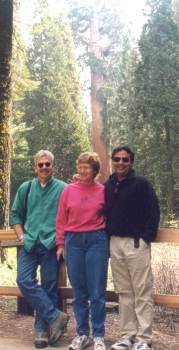 Oops, wrong title - "Lost in Sequoia" describes the *last* time all four of us were in Sequoia, when we tried to go backpacking on a trail that didn't exist (hey, it was there on the map! 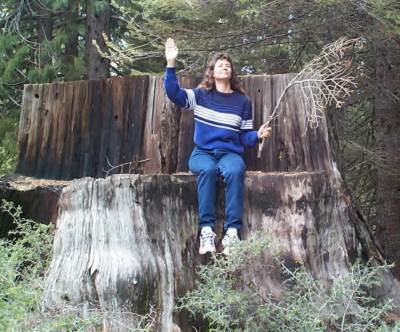 ), and Lee and Walt got lost for half a day and wandered around the forest before finding Barb and me again. Let's see...how about "Oh What a Beautiful Morning"! Because it *was* - I opened the curtains at about 6:50, and saw only blue sky and sunshine! Woo hoo!!!! 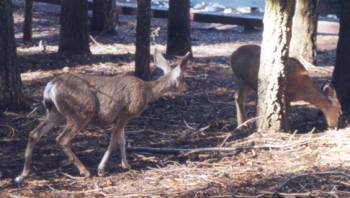 We saw several deer there - they seemed pretty unconcerned about the cars and people. The Muir Grove was very nice - we saw only 4 other people there. We wandered around the grove about 1/2 mile, though the trail/path kept disappearing in deadfalls - it has obviously not been maintained in several years. It was very quiet and peaceful. We had lunch (a suicidal cherry bounced out of my hand - though maybe it wasn't suicidal, it just wanted to see if could grow as big as the sequoia trees), and walked back to the car. 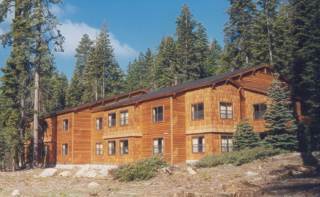 But I digress...The new Wuksachi Lodge is a replacement for the hotel that used to be in Giant Forest - it's just in regular pine forest, several miles away from any sequoias, so doesn't have the same kind of impact. (Though all the sugar pines and lodgepole pines that had to be cut down to make room for the lodge might have a different opinion about that. :-) ) And of course it's a more modern facility which should have less impact on the environment. The only building in the Giant Forest area that they are keeping is the store, which will be converted into a museum. It's been a VERY long process, but progress is being made, especially now that the Giant Forest facilities are closed. For a while they were having to spend money to keep up those aging facilities in addition to developing new ones, and that was very expensive. So, after that, we drove down past the Giant Forest area (too bad we couldn't volunteer to help them demolish some of it!) to the Hazelwood Nature Trail. 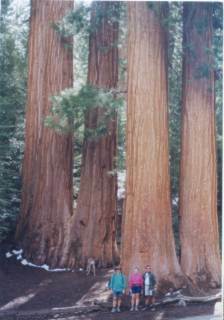 This is a very pleasant, easy walk around a sequoia grove (less than a mile), with signs pointing out some of the features. Again, we had it almost all to ourselves, even though the parking lot was full - the other people must have been off on some of the other trails that take off from there. We felt like we'd had a pretty full day, so we headed back to the lodge to relax and clean up before our 7:00 dinner reservation. For two hours Lee and I got to listen to the child in the room upstairs run back and forth, back and forth...argh. We still thought the food was good, and the prices were very reasonable, especially considering that *everything* has to be brought in via mountain roads. The menu needs some more variety, though (I would NOT have wanted to see the same menu a third night), and a lot of that "Asian-Pacific" cuisine is not going to appeal very much to the meat-and-potatoes Mr. and Mrs. Middle America crowd. Not a very restful night for Lee and me - the running child upstairs got put to bed and was quiet, but then we got to listen to the baby next door wake up and cry every two hours during the night...including a regular tantrum at about 5:30 that lasted for 20 minutes. Guess we forgot to request the "Adults Only" building. Sigh. Check-out was a bit of an adventure...we had that 25% off coupon, but they didn't have anything in their system to handle it, and the first way they calculated it they only gave us about a 5% discount! Walt and I were there for 30 minutes before they finally got it right - but we're still going to be checking our credit card bills very carefully to make sure. 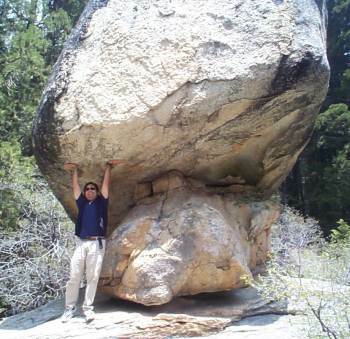 Once we got done with that we headed off towards Kings Canyon National Park, and the General Grant Grove. (You got General Sherman in the southern part, General Grant in the northern part - anyone see a civil war connection here? :-) ) Kings Canyon and Sequoia National Parks are right next to each other, and the "Generals Highway" connects the two. 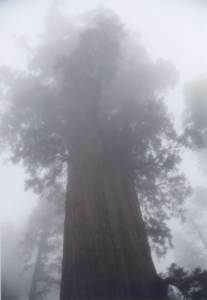 Most of the sequoias are in Sequoia, but there are some in the very western part of Kings Canyon. We saw several Douglas squirrels (chickarees) running around, and I tried to get a picture, but just when I was ready they'd dart out of sight again. On our way out of the park, we stopped at the Big Stump area. 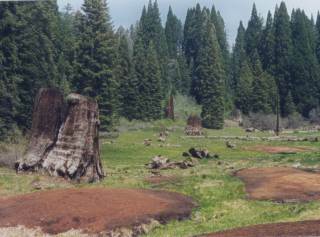 This area is now within Kings Canyon National Park, but back in the 1880s beofre the park existed it was logged, before they realized that logging sequoias just wasn't profitable. 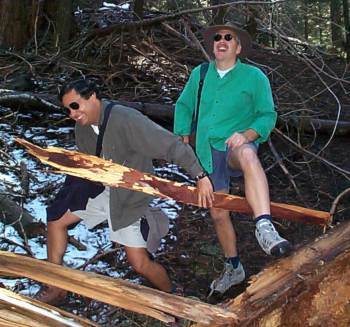 :-) The trees tended to shatter on impact, giving them lots of instant mulch rather than board feet of lumber. There's a trail here that goes by many of the stumps - and a few trees that were somehow spared. We had a lot of fun taking pictures and climbing on the stumps. 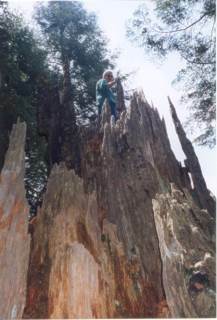 One interesting thing about sequoia stumps is that they are VERY high - they usually cut the trees anywhere from 4-12 feet higher than ground level. 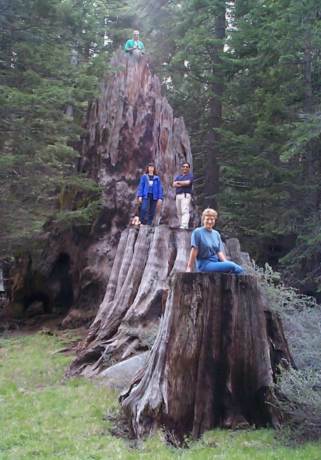 In the picture you can see that we are on 3 different stumps of varying heights - Lee was probably 15' off the ground. 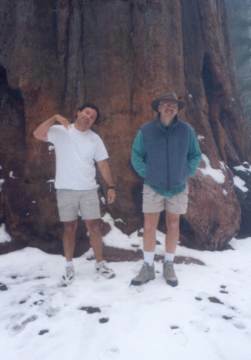 We saw the "Sawn Tree", which is a sequoia tree that was sawn through about 1/3 of the way before they suddenly quit. I'm not sure why this tree got a reprieve (maybe the Governor called at the last minute? :-) ), but though you can clearly see where it was cut, the tree seems perfectly healthy otherwise. Once we got back to the car (I assured them that the trail DID loop back to the parking lot, but they were doubtful for a while) we hit the road, and wound our way back down the mountains and foothills and back to Highway 99. We made good time, and were back at our place in about 7 hours. Except for Friday we had really nice weather - the highs were probably in the mid 60s. 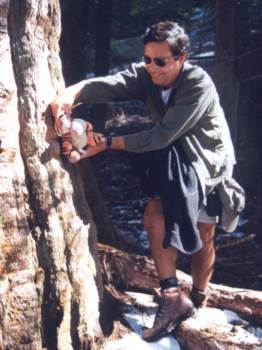 Not quite shorts weather for me, but very comfortable for hiking. There were very few people around - even at the two main trees we didn't see a lot of other people, and on our hikes we had the trails to ourselves. The Wuksachi Lodge was very nice, but still needs some work. I'm glad we *didn't* have to pay full price for the rooms. I think a lot of the problems are mainly due to the place being new and not yet complete - there are obviously a lot more buildings and facilities that WILL be going in, but have not yet been built. But we'd still stay here again in the future - though we hope there will be some chocolate desserts on the menu! There's still a lot more things here that we *haven't* seen - we really haven't been to the Kings Canyon area at all - it would be nice to visit Cedar Grove. And the Mineral King part of Sequoia is supposed to be nice, too. Text and photographs copyright © 1999, by Laura Gilbreath and Lee Zimmerman. Feel free to link to this document, but you may not redistribute it in any form without the express written consent of the copyright holder.